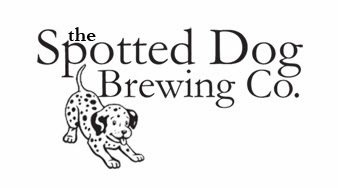 Overdue Tasting Update ~ Spotted Dog Brewing Co. So...I've been lazily drinking all the beers I've been brewing and haven't put down any tasting notes whatsoever. Now that I'm almost done with some of the batches, I realized I should probably put some thoughts on paper to make some improvements for the next go-around. Aroma - Holy hops. Tons of that dank, resiny, citrus hop character that you get out of Pliny. The nose practically leaps out of the glass. Appearance - Perhaps a touch darker than the real thing. This doesn't really bother me all that much, but I don't think I can call the color cloned. Maybe changing out the C20 for some C10 would do the trick. The head is very white and fluffy and sticks around forever. The lacing is very nice as well. Flavor - Complete bitterness explosion. I almost think that if I do this another time I'm going to cut the Magnum bittering charge in half and try to get most of the IBUs from the later additions. There's just too much harsh bitterness on this that isn't in the original. Once you can get past the initial bitterness shock, the nice citrus/pine character comes through. Mouthfeel - Surprisingly has a full mouthfeel given the mash temperature and the sugar added. Carbonation is pretty spot on. Overall - Hrm. The massive harsh bitterness on the front end really hurts this one in my opinion. Perhaps a little bit of a thinner body coupled with a more "balanced" hop profile would bring this more into line. I'm going to table this recipe for a little bit and perhaps revisit it in the Fall. Aroma - Citrus, melon, a small hint of the white wine character for which Nelson Sauvin is famous. 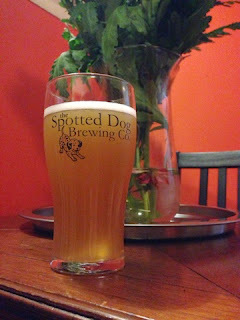 Appearance - Nice orange/bronze hue, cloudier than I would have planned likely due to the dry hopping. Nice head after pouring, very slowly dissipates to a thin layer of foam that sticks around. Nice lacing. This is a solid recipe for looks. Flavor - Very similar profile to the aroma. The Nelson/Galaxy combo definitely hits first with a ton of melon/white wine. This is followed up with some nice malt sweetness with the honey malt really shining through. If you are a fan of Ithaca Flower Power, the malt portion of this beer tastes very similar. Mouthfeel - Some nice body on this one that leaves a sweetish malty texture on your tongue. I tend to prefer my beers, even hoppy beers, with a little bit more body and malt backbone, and this one definitely fits the bill. Spot on carbonation. Overall - This is definitely in the running for my house APA. The malt backbone is dead-on. I probably should dry this out a bit more to showcase some of the hops, but that's really my only critique on this one. Aroma - Nice clove aroma with some muted wheat/hay type smells coming out. Almost like fresh baked bread. Appearance - Cloudy, golden-orange hue. Nice dense, creamy head at the pour, but it falls away somewhat quicker than I would like. I may potentially kick out the protein mash rest next time I brew this. Small layer of bubbles sticks around until the finish. Flavor - Really nice balance of clove/banana. The somewhat fruity flavors are followed by a nice wheat/bread flavor that almost tastes like biting into a fresh baguette. I know decoction mashing has its opponents, but that's really the only thing I changed process wise this time around and I'm very close to the hefeweizen that I want this to be. Mouthfeel - Very creamy. This was a trait that I'd always relished from some of the great commercial examples of the style. I bottled carved this up to 3.0 volumes and was a little worried about bottle bombs, but it almost seems like its a touch under carbonated and when popping the cap it seems like there really wasn't all that much stress inside. I may try to carb this higher next time to improve head retention and some of the body. Overall - I'm getting really, really close on my perfect hefe. I don't know if this will win any competition (although I'll hopefully be finding out soon), but this batch is one of the quickest I've gone through in my entire time brewing. This is definitely going on the calendar again with some of the changes listed above. Aroma - Slight amount of citrus on the nose with a bit of the chocolate malt coming through giving a very, very faint roasted coffee aroma. Appearance - Beautiful deep brown hue when it catches the light. Probably a tough darker than I would have liked, but its easy enough to dial back some of the chocolate malt. Flavor - Very nice balance between the malt and the hops. Definitely doesn't come across as an overly-hoppy beer or something like a "red" IPA. So that's good. However, I probably will cut down the amount of chocolate malt as its definitely coming through in the taste and I was planning to use it solely for color. Also, the hops on this one are probably better served in an IPA where they can be showcased. I might just switch this to straight Centennials for the next batch. 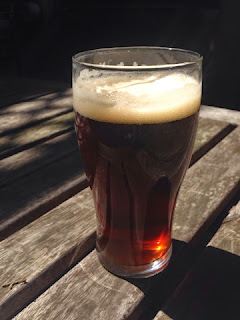 Mouthfeel - This is definitely on the more full-bodied side, and while its a wonderful beer, probably would be better somewhat thinner for this time of year. I could see this as a great fall beer as is. 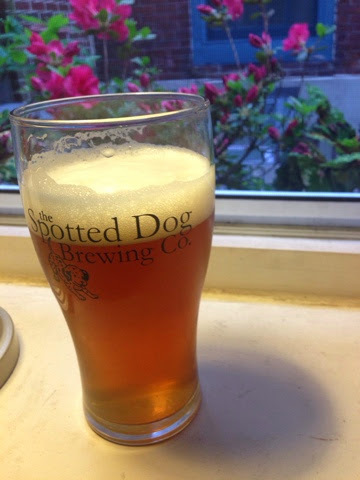 Overall - This is a really nice departure from the usual hoppy stuff that I brew. Next time around I think I may mash lower, switch to straight Centennial with maybe some Citra in the dry-hop and either lower the chocolate malt or layer in several different crystal malts to get the color a little lighter.